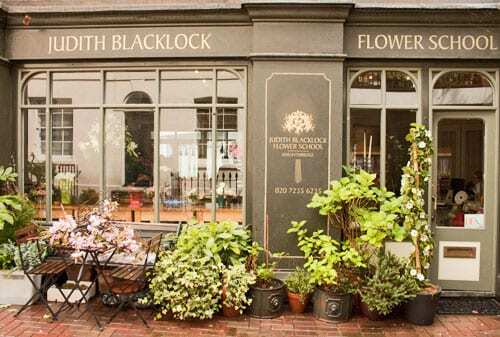 Last month, I was delighted to be invited to attend a one day Wedding Flowers course at the Judith Blacklock Flower School in Knightsbridge in London. And what a wonderful day it was…a perfect antidote to this grey, wet and windy weather that we’ve been having lately here in the UK. Amongst the attendees were florists and mothers of brides-to-be who wished to learn how to plan and create wedding flowers. I was so impressed by the amount of detailed advice that Judith covered in the morning session. 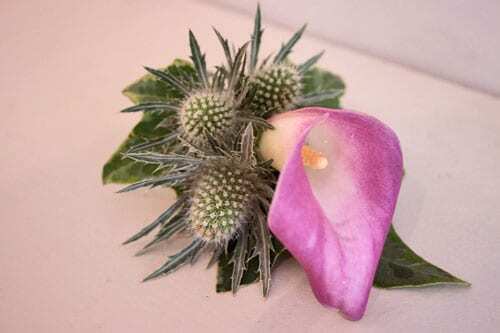 Everything from wedding flower trends to the different types of arrangements which you need to consider to decorate a church and reception venue, to even making sure that you’re up-to-date with your tetanus injection. 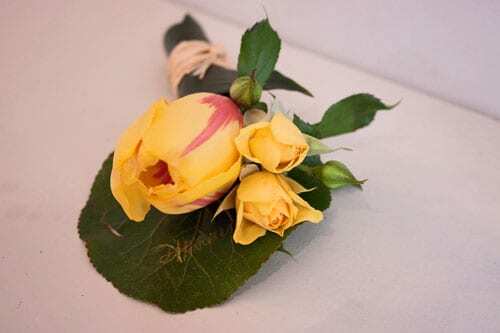 During the first step-by-step demonstration, she showed us how to make a table arrangement using ruscus, galax leaves, guelder rose, roses, double tulips and sweet peas. Each stage was explained from how to soak your floral foam, to tips on how to green up with foliage, to how and where to place the blooms. Judith then showed us how to make the lovely little design on the right below, which could be used on reception tables as a wedding favour. She took a small block of floral foam encased it in black plastic and then covered it with an aspidistra leaf. 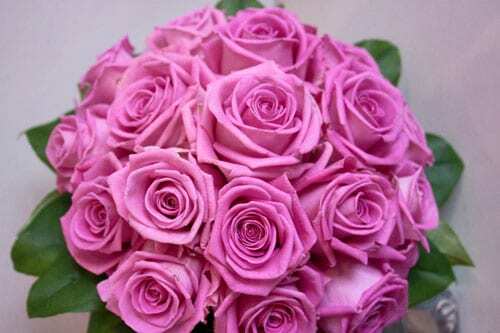 Three galax leaves and a rose were added to complete the design. Judith suggested that the name of the guest is written on one of the leaves and they could then take it home as a memento of the wedding. 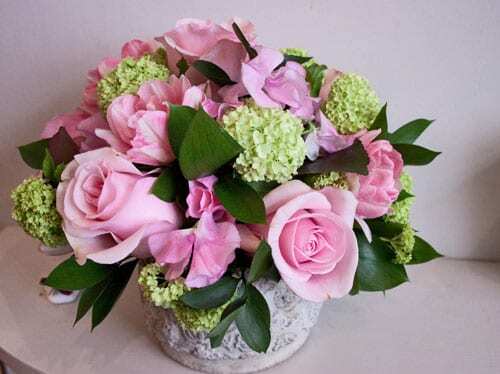 Then, she demonstrated how to make the tall arrangement below, using a posy pad placed on top of a cylindrical glass vase. 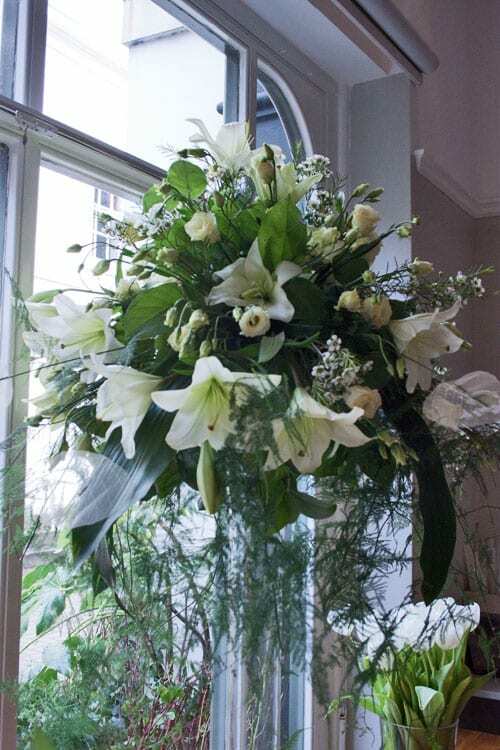 Asparagus fern, aspidistra leaves, eucalyptus, salal, flexigrass, lilies, lisianthus and waxflower were used. After lunch, the class was led by Annette Parshotam. 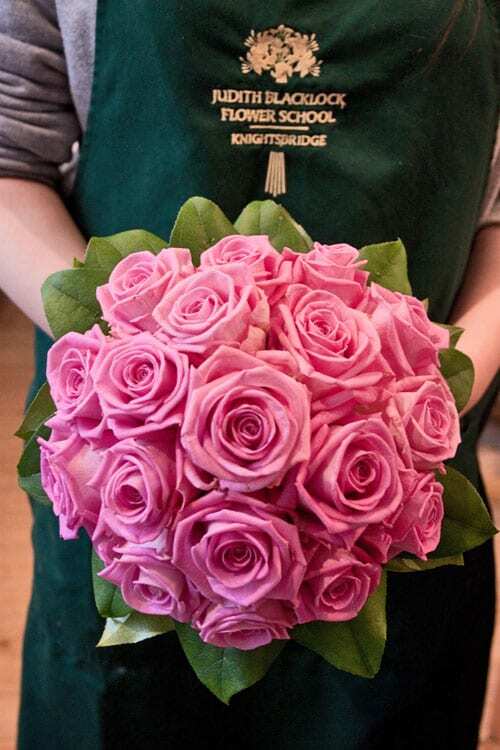 Annette showed us how to create a massed rose bouquet using Aqua roses, suitable for a bride or bridesmaid. 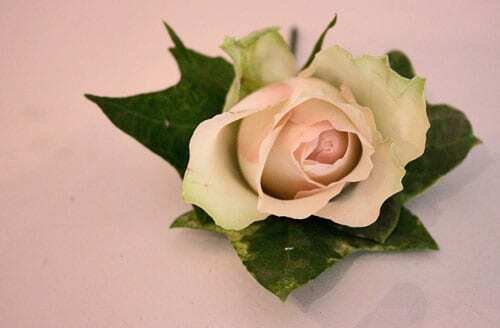 She then showed us how to create a rose buttonhole, using wiring techniques. Wiring tends to be a bit of a ‘Marmite’ job in the floristry industry, you either love or hate doing it…and personally, I love it! Here’s my finished design below. She also demonstrated how to make a napkin ring using moss, African violets and rosary vine. Plus how to make a pew end, which could also be used to decorate the back of a chair. 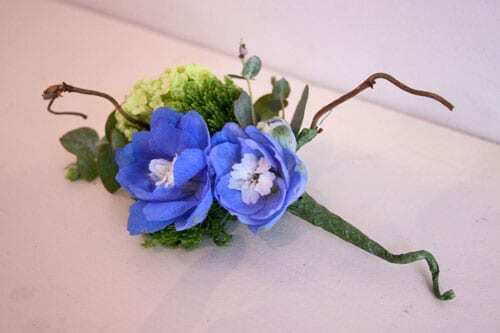 If you would like to learn how to create beautiful wedding flower designs, I highly recommend this one day Wedding Flowers course. So much was covered during the day! 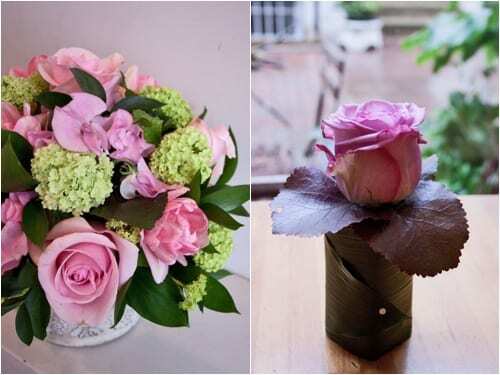 Judith and Annette gave lots of advice about when best to start working on floral designs prior to a wedding, where to buy containers, which flowers are in season when and what types of arrangements to create depending on your budget. The quality of the flowers we used was absolutely top class and I will treasure the vintage stone container which we used for our table arrangement. If you’d like to know more about the very talented lady who set up this flower school, here’s a link to an interview which I recently did with Judith for Flowerona. Lucky you, Rona! And your bouquet is gorgeous! Would love to attend such a class one day.